A delegation of US diplomats in Vietnam and the Center for Community Human Resource Development under An Giang University co-organised a workshop titled "Young Southeast Asian Leaders Initiative (YSEALI) 2018: Protecting The Mekong Delta Environment", in Can Tho city, from June 4 to 9. The workshop gathers the participation of 120 students from nine countries in the Young Southeast Asian Leaders Initiative program. Participants will study and observe the latest consequences of environmental changes in the Mekong Delta, identifying direct impacts on people's incomes and livelihoods, as well as on economic development in the area. From there, they will come up with initiatives and proposals to minimize the damage and models that help people in the region to develop economically and sustainably in the context of climate change. At the workshop session on June 5, U.S. 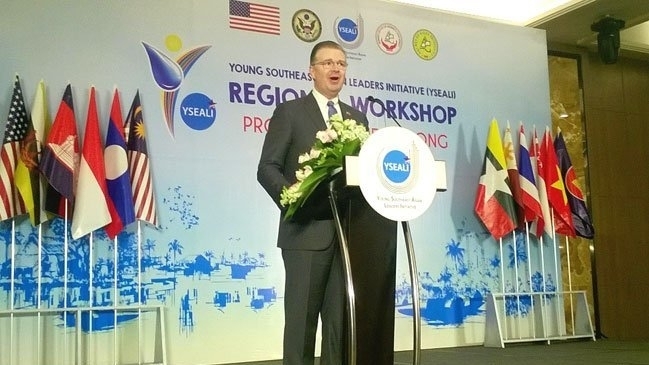 Ambassador to Vietnam Daniel J. Kritenbrink said the Mekong Delta environment plays an important role in the area, so the U.S. government is contributing to creating a sustainable future for the Mekong River area. Protecting the environment of the Mekong Delta benefits residents and fosters regional development and Southeast Asia’s security, he said. Ambassador Kritenbrink noted that both the Mekong Delta and the Mekong River area are facing environmental challenges. The ambassador said that through the Lower Mekong Initiative, the U.S. government has been aiding Lower Mekong countries through a long-term food and energy supply.